Join the discussion on our forums! Come discuss Ancient Harbinger over in our dedicated Ancient Harbinger discussion topic. This just happened to me after Gadgetzan launch. Druid opponent drew a wild growth and swipe at the end of his turn after the card's animation played, and he started the turn with two cards when he was already topdecking. If someone could figure out how to bug it, it could be super exploitable. I couldn't recreate it in practice. What no way are you sure? He was drawing 1 on top of his normal draw you genius. Actually the animation always plays but you don't always draw a card. it's very confusing. this minion sure is nice in all OG decks. It seems to be a hard fit for a lot of decks, but I really like this card in my C'thun decks. All I need is one, since the chances of drawing either it or C'thun are very high, and even with C'thun in hand, I'll play this card just to watch my opponent fall over themselves to kill it. It may have a big target over its head, but it's also a great decoy. Also C'Thun-YS and YS-N'Zoth decks are on the rise, so the argument of 'Why would you run this if there's only one 10 drop in your deck' can be easily debunked. God forbidden you might even see this used to draw Sea Giant or Deathwing Dragonlord? I may have found a glitch in this card. It states "At the start of your turn, put a 10-Cost MINION from your deck into your hand". My Standard C'thun Priest deck includes both the "C'thun" card AND the "Mind Control" card, which is a spell and NOT a minion. A few games ago, my "Ancient Harbinger" survived to the start of my turn and drew "Mind Control" when I had both "C'thun" and this card remaining in my deck. I play a Warlock deck with C'thun, Ancient Harbinger and DOOM! cards. Ancient Harbinger has repeatedly drawn DOOM! (Spell card destroying all minions in play and drawing cards equal to number of minions destroyed) which is also a 10 cost card. My thinking is, and may be confirmed by your experience with Mind Control, that the Ancient Harbinger card is conflating the word "minion" in the card's flavor text (Mind Control, DOOM! et. al.) with an actual minion card. 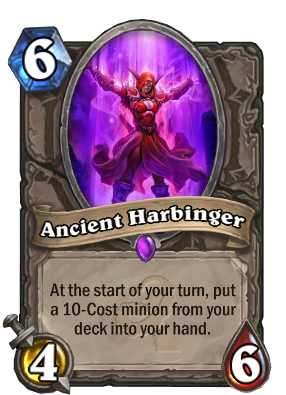 Either that, or the Ancient Harbinger card's effect is to draw any 10 cost card, and the flavor text on there is wrong. I've reported on the Hearthstone Bug Report forum personally, though it may be good to have more people do that. Just a note, this card WILL pull back a card lower than 10 if no 10 mana cards exist. Just had a tavern brawl deck pull back Nefarian. Just a note, this guy is absolutely wrong and doesn't know what he's talking about. I think you're missing the point. This card is like Emperor Thaurissan or Slyvannas, it has "taunt" implied and its stats are comparable to its two counterparts although she's a bit healthier than those two with -1/+1. So this is a good card to bait out removal and if they dont remove her, well now you get C'thun and you win once you hit turn 10. This card doesnt hurt your curve if you end up playing her turn 6 and hell if you top deck her late you might get lucky as hell and she survives and you get c'thun which is the last card in your deck this particular game and you win a game you weren't supposed to. So handlock? is that what I should be thinking? Why else would you overpay for a minion that is gonna give you a card that you won't get to play in half your matches? I was thinking handlock modified to hold a 10 cost minion, such as a deathrattle focussed handlock with N'Zoth, or a Cthun handlock. I was probably on the wrong page and just thinking of decks where the goal is to stall and stall and stall to the late game. In particular decks where you would have taunt to protect this guy for at least one turn (such as handlock). He is a super vulnerable minion - decent health, but he has a big target on him if turn 10 is approaching or past. Might as well just say "Put C'Thun in your hand if your opponent isn't paying attention for a turn." That's what they were obviously thinking about when they made this card.